I learned to cook by wiping banana leaves in the kitchen of my ba noi (Vietnamese paternal grandmother). Actually, I think every grandchild (all 20 of us), had at one time or another been given that task. 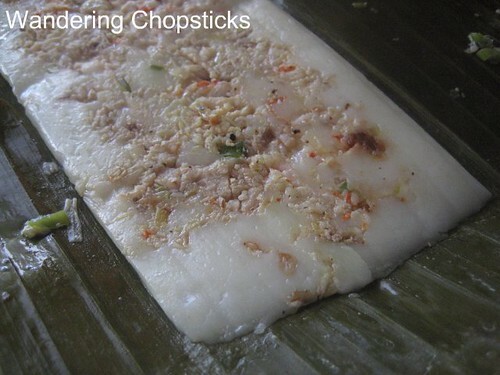 Her specialty was banh nam (Vietnamese steamed flat rice dumplings with pork and shrimp). Sometimes I would help her put the meat on the dough and wrap the banana leaves to make these flat rice dumplings. While I helped, I never did learn her recipe. Ba noi passed away nearly six years ago. I still can't eat banh nam without crying so I often avoid it at family gatherings. Also, my aunts don't make it quite the same. The dough isn't as tender. The dumpling sometimes a bit too thick. It just wasn't the way grandma made it. Then recently, youngest auntie stopped by with a few banh nam that she had made. There, in the comfort of my kitchen, without anyone to see, I slowly savored each dumpling. Youngest auntie's version tasted as close to grandma's as my memories could conjure up. I cried the whole time, of course. I later told her to call me the next time she makes some. This time, I vowed to learn. File this away as one of the family recipes I'm not willing to share. Banh nam is a central region specialty. It's #12 on my list of 100 Vietnamese foods to try. 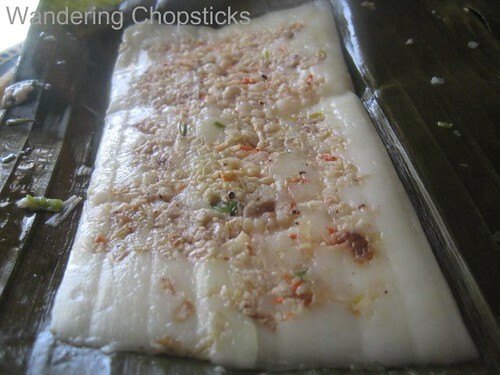 Banh la is the clear tapioca flour version. 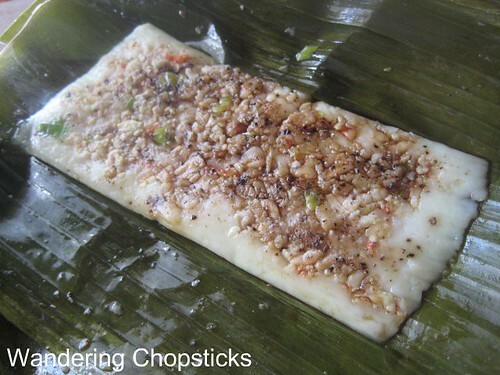 Noodlepie has a picture of banh la on his blog. Disregard the title, it's incorrect, this is banh nam. Anyway, both banh nam and banh la are flat. 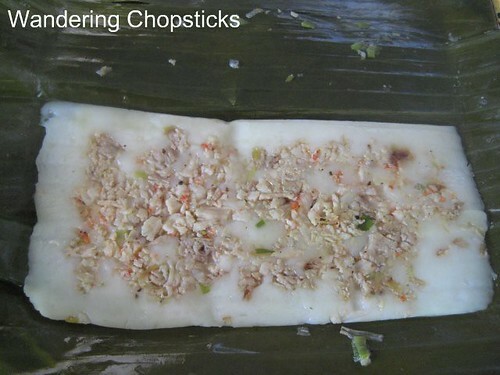 Both have a mixture of pork and shrimp filling on top of rice or tapioca dough. Sometimes grandma added chives or ground black pepper. They're wrapped in banana leaves and steamed. Youngest auntie also made a version with more black pepper, for those who preferred it, just like grandma. For some reason, probably because that's how my ba noi liked to eat it, I eat banh nam doused in soy sauce instead of Nuoc Mam (Vietnamese Fish Sauce). My salute to my grandma seemed only fitting on this historic evening. I don't know which way my grandma would have voted. I remember helping her study for her citizenship exam, coaching her on how to pronounce George Washington correctly. I was so proud when she passed her exam and became an American citizen. While I'm ecstatic with Barack Obama's election as America's 44th president, I'm also saddened that his grandma didn't live one more day to see it. What memories do you have of your grandma? 1 year ago today, muop (Vietnamese loofah). 2 years ago today, Goi Ga (Vietnamese Chicken Salad). Don't be sad. I am sure your grandma is watching and guiding you from above...and I can bet, she must be so proud of you! I'll bet your Grandma is your guardian angel - mine is. What a very nice tribute and although I'd love to try your recipe, I resepct your wish to keep it as a special family memory. Before you put the sauce on it, I was assuming this was a dish you eat with your hands straight out of the leaf--like a burrito or something. But I guess chopsticks or a fork would do? My paternal grandmother passed in 1980 when I was a kid. She was from Savannah and made the most delicious southern food. My faavorite was her choclate sheet cake. So moist and chocolatey! They day after she died, my grandpa offered me her very last piece. I could not eat it. No way. I'm getting choked up even thinking about it even though it was 28 years ago. My wife makes it for my birthday every year (which is right around when she passed away). It gets closer each year. Man it's good! I really wish she hadn't passed away so young--59. But southern food isn't necessarily good for your heart. I'd so much love to have her teach me all of her dishes. Greens, fried chicken, etc. Man...thanks for promting these memories. I really miss her. sigh. i love banh nam! and i'm ok with eating with nuoc mam or soy sauce. i still have my ba noi, she's the one i talk about in my blog. she is creeping up there in age and i hope to make it out to CA to see her and ong noi summer 2009.
my fave memmory of her... hmmm... she always walked me to school. and she taught me long division in 1st grade. I KNOW! over achieving asian kid much? and i also quizzed her when she was studying for her citizenship. My Ba Noi was an awesome cook. I wished I learned from her before she passed. She was the one who taught me to knit in the beginning and took erme to the park when we were young. I understand how you feel about yours. Now you're making me weepy. Lovely tribute to your grandmother. Sometimes kids don't realize how much their grandparents mean to them until they're gone. I know Sonny loves his grandparents now, and I hope he always has fond memories of them. I wasn't lucky enough to know any of my grandparents well because none lived close enough. My own grandmother on my mother's side passed away 2 days before Christmas in 2005. She was 101 years old. We always hoped to take Sonny to see her before she passed away, but we were too late. He did get to see Hubby's grandfather and we have wonderful pictures of them playing. He passed away a few months after we visited. It broke my heart that Obama's grandmother didn't see him win either. But I think she already knew. What a sweet story. Thanks for sharing! I think every family has one. Every time I pick up a can opener I think of my late mother....okay, maybe she wasn't such a great cook, but she inspired in so many other ways and not a day goes by I don't think of her. And when I got to cook for her and saw her smile....there's nothing so satisfying. aw, *hug*. I can't think of a food that causes me such strong emotion, but I do love my ba noi! She's the only one I have left and I wish that I was closer to her (physically and emotionally). My family says that I'm her favorite because I always agree with her (because I hardly know anything else in Vietnamese!). Besides her great cooking, whenever I think about her I remember when she lived at our house, and in the afternoon she would relax in the hammock with our dog by her side. It reminds me of life's simple luxuries. ooooyeeeeee! i first had this 3 years ago when i was dating a vietnamese guy, at his sister's wedding... i fell in love with it (it's like mochi! ), but i haven't eaten it since then. I have also something wrapped in a leaf! Been some time since we are in sync! I've never heard of banh nam being wrapped in la dong. Learn something new every day! Oh no, much too soft and pliable to be able to eat with our hands. I usually just eat with a spoon. Divide and scoop. Thanks for sharing your story about your grandmother. Chocolate sheet cake is best with loads of butter. Actually, all Southern food is best enjoyed with loads of butter. Definitely not good for the heart. I'm sorry she passed away so young. SoCal or NorCal? We should meet up if you're nearby when you come visit her. Long division in 1st grade? Crazy! I don't think my mom taught me until 3rd grade. I always get weepy when I think of my ba noi. 101 wow! I think it's amazing to be able to live that long and have great-grandchildren. Mochi. Hmm. I've never eaten any savory mochi before. I've never heard of Zhang before. Must be on the lookout. I know! We haven't had any synced up postings in quite a while! Oh my. Our grandmothers give us so much, don't they? For me, my grandmother made the best chicken soup. I never got her recipe, which really saddened me, until I found a cookbook called "Love and Knishes" which looked good. Not only did it look good, it WAS good. Many of their recipes are spot on in recreating my grandmother's eastern european cooking. oh my... that picture brings back memories... thanks. I miss my grandma every day. :( I love chicken soup. Was it chicken and dumplings that your grandma made? I think, even if we wrote things down, so many of the foods we love are tied with memories of the person who made them. I know that sounds simplistic but while I can enjoy eating banh nam for its taste, it's still so hard for me to eat it without thinking of my grandma and crying. This dish reminds me of my ba noi as well. She knew they were my favourite and would send some down to Melbourne for me. And by some I mean boxes full. I really need to get the recipe,she's 93 so she doesn't cook as much anymore. I make banh nam from my mom's recipe, and even though it doesn't quite taste the same as my ba noi's version, the niece and nephew like it a lot. So in some small way, the tradition lives on.